Holy water (Theertham) : Agni Theertham, Surya Theertham, Chandra Theertham. Sacred Tree (Sthala Vriksham) : Vilvam, Kondrai, Vadaval. Thevaram : Sambandar - 3 ; Appar - 2 ; Sundarar - 1. Timings : 06:00 a.m. to 12:00 noon and from 04:00 p.m. to 09:00 p.m. This is the 11th sthalam on the northern side of river Cauvery. Saint Thiruganasambandar, Tirunavukkarasar, Sundarar has sung hymns in praise of lord Shiva of this temple. This Shivasthalam is one of the 6 most sacred places on the banks of river Cauvery which is considered as equivalent to the temple at Varanasi. The other 5 shivasthalams are Tiruvaiyaru, Chaayaavanam, Mayiladuthurai, Tiruvidaimarudur and Tiruvanchiam. Indiran, Airavatam, Budhan, Sun God Sooriyan and Moon God Chandiran are said to have worshipped God Shiva here. 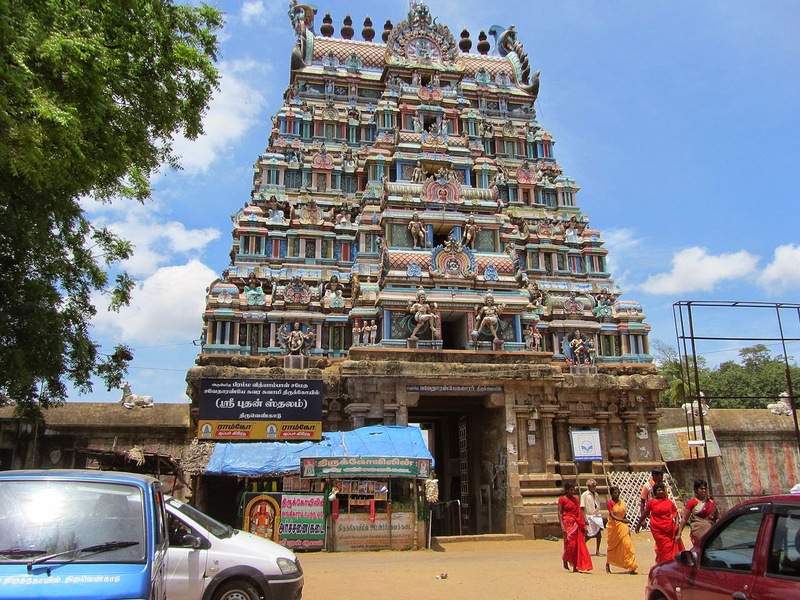 From the stone inscriptions found inside this temple, it is seen that the earlier chola kings Aditya Chola and Rajaraja Chola have made a lot of contributions to this temple. There are several shrines of significance in this well visited temple, including those to Durga and Kali. The image of Natarajar here is of great beauty. Worship to Aghoramurthy - (Veerabhadrar) is said to be of significance on Sunday nights in this temple. As found in Chidambaram, there is also a shrine for Lord Vishnu near the shrine for Natarajar. Swetharanyeswarar Temple enshrines a separate sanctum sanctorum for Bhudhan or Bhudan, one the nine Navagrahas and the bestower of wisdom and wealth. For good children one has to worship mercury after taking bath in place called chandra pushkarani related to mercury's father navagraga moon.By worshiping navagraga mercury one can excel in subjects like astrology, music,maths,medicine, reading and writing in multiple languages. Amman here is called Brammavithyanayagi. Rudra patham called rudra gaya is under vadaval aala virutcham in this temple. This is said to be removing pithru dosha of 21 generations. Nerve related problems are solved.Speech will be improved.This temple is said to be more than 2000 years old. The deity is called Aghora-murti in the east facing pose and it is said the deity is self incarnated. The deity is also called Sweta-aranya-swami. The deity has five faces,they are Easanam, Tatpurusham, Aghoram, Vamadevam and Sadyojatam. Nandi is usually installed in the sanctum of Lord Siva. But here it is sculpted at the entrance of the devi's sanctum which the is peculiarity in this temple. The Lord's consort Devi Vidya Nayagi amman has a separate Sanctum also facing east. There are three 'teerthams' inside the temple.They are called Agni theertham, Surya theertham and Chandra theertham. It is said that three drops of water that fell from Lord Siva's eyes when he was dancing formed into these 'threethams'. The temple tree are' Bilvam',' Vadaval', and 'Konrai'. This place is also called Adi-Chidambaram (Ancient Chidambaram). There are many stone inscriptions giving the details about this kshetram. Once Swetaketu did penance in this temple to Lord Siva for many years The Lord appeared before him. Swetaketu requested the Lord that he wished to see his seven kinds of dance performances. The Lord happily accepted his devotees wish and performed the dances for Swethaketu in this place.The dances were Ananda thandavam, Sandhya thandavam, Samhara thandavam, Tripuranta thandavam, Urdhva thandavam, Bhujanga thandavam and Lalita thandavam. Many years ago this place was surrounded by thick forests on all sides which when seen from a distance looked like a white shadow. Hence the name of this place is Tiruvengadu ( means white forest -Ven means white and Kadu means forest). In Sanskrit it is known as Swetaranyam (Swetam means white and Aranyam -means forest). There was a farmer who lived at Pennagadam in Tanjavoor district. He had no children. As advised by his preceptor he came to Tiruvengadu to do penance to Lord Siva. which he did for many years. One day the Lord appeared before him and told him that he was not destined to have a child in his current birth. Then the farmer bowed before the Lord and said: "Lord it is not necessary that I should have a child Because I am not a king having a big kingdom to be succeeded by a prince. However after my life who will sing devotional songs to you? That was my worry If I am not destined to have a child in this birth." On hearing this the Lord was pleased and said "you will have a child in this birth itself as you wished" and disappeared. After some for time the former got a male child. Another legend is there was a demon called Marutwasura who was giving trouble to the sages and villagers in Tiruvengadu. All the people of village and sages prayed to lord siva and expressed their grief. 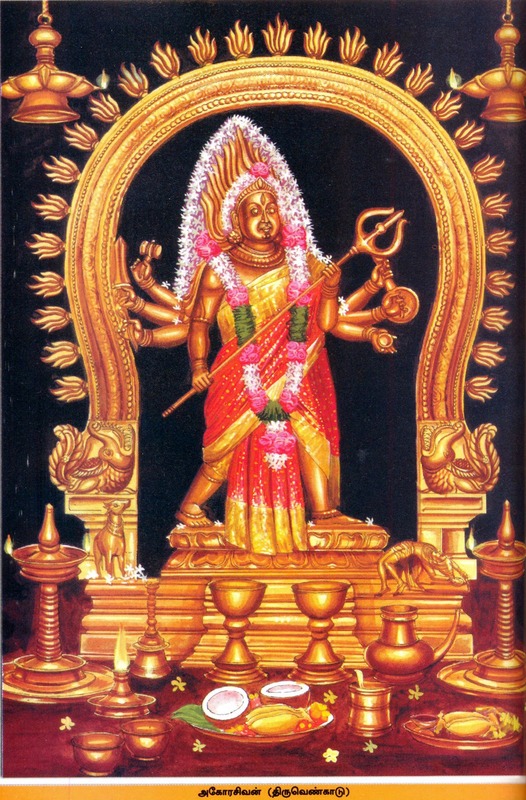 Hearing his devotees' appeal Siva sent Nandi (his mount) to fight with the demon. Nandi threw the demon into the sea and happily returned to Siva. The demon got angry with Nandhi and performed penance for long years to lord siva. At last the Lord appeared before him and asked the purpose of the penance. The demon bowed his head and asked "Lord I wish to have a trident" . The lord granted him a trident with a warning that if he gave trouble to others like sages he would be killed by the trident which he granted to him. The demon happily agreed. Later he forgot about his boon and again created trouble to the villagers and the sages.The Lord angrily sent Nandi to kill the demon. But Nandi could not fight as the demon was holding the trident of Lord Siva. Nandhi sustained nine wounds and returned to Lord Siva saying that he would not fight against his master's trident. The Lord was furious that Nandi had almost been killed by that demon (Marutwasura) and angrily opened his third eye out of which a flame came flashing out. On seeing the flame the demon could not fight. He turned into another flame and merged with the flame that had come out of the third eye of Siva. Both the flames formed into a 'Jyothi'. 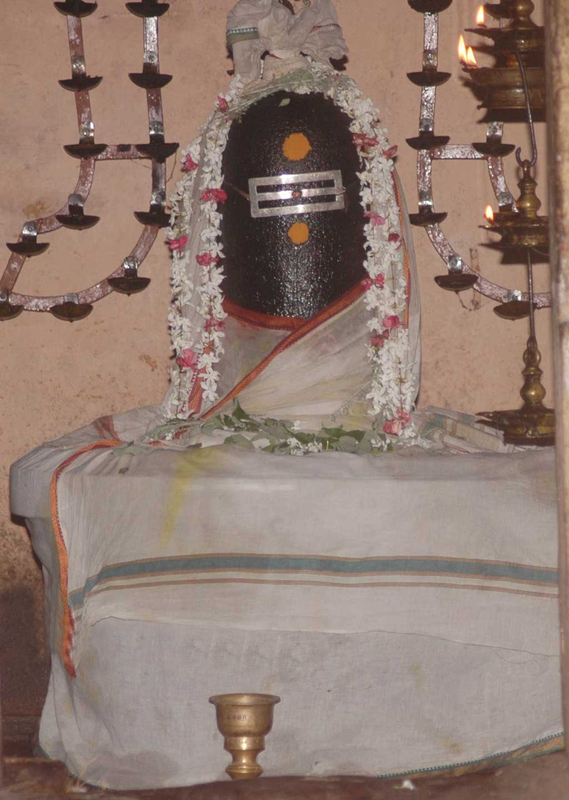 The sages prayed to the lord that the jyothi be turned into a tangible form and accordingly the jyoti turned into the idol Aghoramurti, which is installed in this temple. Swadharanyeswarar, Nataraja, Agoramurthy, Brahmavidyambal, Swetha Mahakali and Maha Durga. Of the 64 Murthas of Lord Shiva, the Agoramurthy form is here. Vishnu has a place near the Nataraja here as in Chidambaram. Indira, Iravadha (the white elephant) Vishnu, Sun, Moon, Agni (fire) worshipped the Lord. 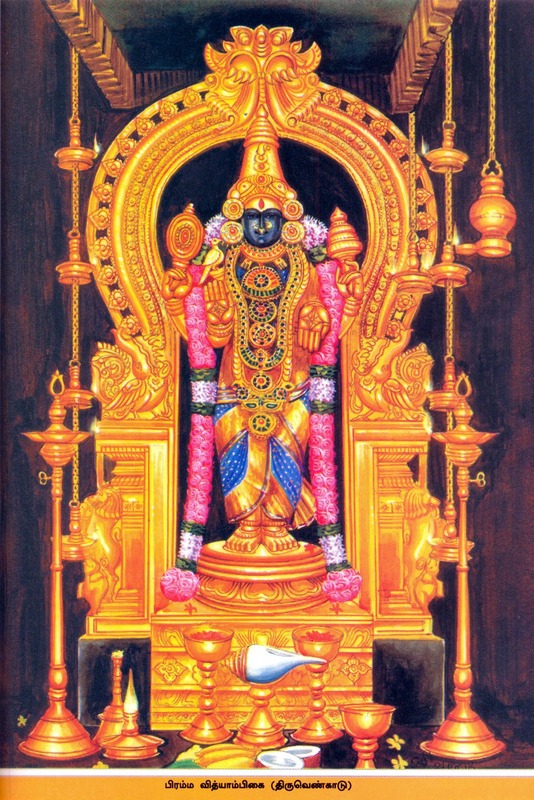 The presiding deity is Swedharanyeshwarar and his consort is Brahmavidya nayaki. The Lord Bhuda faces North East direction. A temple for Chandra (moon) the father of Mercury is just opposite to the Bhuda Shrine. The native of a horoscope may suffer from lack of progeny, nervous problems and may not do well in academics and other arts, if Budhan is unfavourably placed. Worshiping Budhan on Wednesdays here will alleviate the problems occurring out of Budhan dosham. Malefic effect of Budhan can cause problems related to respiration like asthma and bronchitis, speech impediments and nervous disorders. Budhan is considered as the wisest of all the planets. Budhan is associated with intellect and knowledge; hence those who are not doing well in studies should worship Budhan here. Budhan blesses one with good education, knowledge, eloquence, music, astrology, mathematics, sculpture, medicine, scholarship in languages. Offer Green cloth & Full Green Moong Daal (pachchai paruppu) to Budhan here. The special is Three Moolavars, Three Ambals, Three Sthala trees and three Theerthangal. Location: The temple is 10 Kms by road from Sirkazhi on the way to Poompuhar. Town Bus facilities are availbale from Sirkazhi. It is also one of the Navagraha Sthalangal and has a seperate shrine for Budhan (Mercury). Phone: 04364 - 256 424.